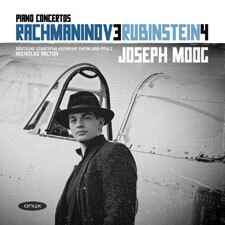 Two great Russian piano concertos performed by Joseph Moog; described by Gramophone as possessing ‘a poise and maturity remarkable in so young a pianist’. The magazine went on to praise his recording of the Liszt concertos as having ‘a seriousness and sheer musical quality that make all these readings shine with an overall mastery and insight’. Rachmaninov’s Third Concerto is considered one of the most challenging ever composed, and Rubinstein’s turbulent Fourth Concerto, once one of the most performed of concertos, now neglected, deserves to be better known.